When three homeless sisters heard a church in Highland Park would soon open a nighttime shelter, they quickly went to check it out. After all, their only other option was to keep sleeping on the floor of a public restroom at Sycamore Grove Park, where they’ve bedded down for the last few months. 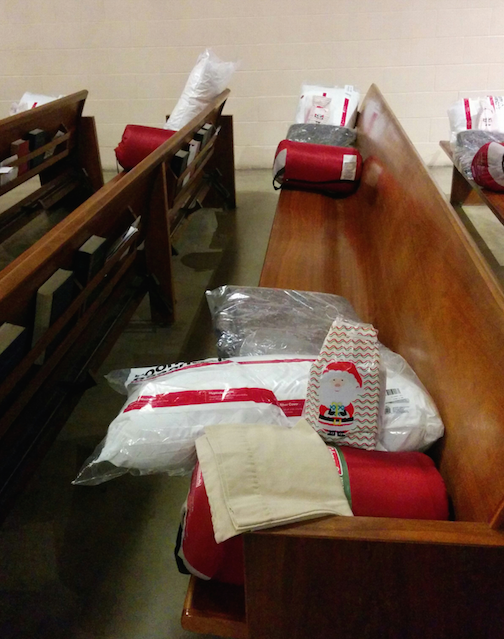 The pews at All Saints Episcopal Church welcomed them with a sleeping bag, a pillow and some toiletries. Warm meals are offered in the small kitchen while movies are projected onto a screen. 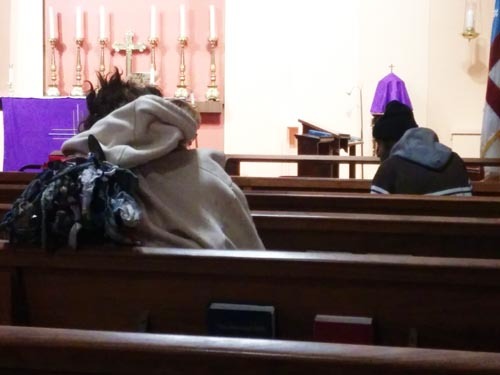 More than two weeks have passed since the sisters started their nightly ritual of lining up to secure a pew – a welcome respite from the outdoor elements and the restroom floor. “It’s way better than sleeping in the cold,” says fifty-six-year old Hope, who did not want to give her last name. The sisters were among the first six people to gain admission to the church shelter when it opened Dec. 1. Within days, the Winter Access Center shelter was at full capacity and people had to be turned away, said Rebecca Prine, volunteer director of nonprofit Recycled Resources for the Homeless, a public charity in Northeast L.A. In September, Mayor Garcetti and members of the city council declared “a state of emergency on homelessness” and committed $100 million to provide permanent and transitional housing to those in need. Months have passed and homeless activists have grown impatient with the city’s slow response. Temperatures are falling and El Niño storms are on their way, said Prine, explaining Recycled Resources had to step in after seeing no action from the L.A. City Council. Local neighborhood councils, businesses and volunteers collaborated to find a place for their homeless neighbors. Rev. W. Clarke Prescott of All Saints Episcopal Church agreed to open the church as a temporary winter shelter. The church has space for 30 guests per night. There’s a small space on the second floor for people with children; pets are also welcome. But more help is needed, said Prine, criticizing city officials for not stepping up. Representatives from the Los Angeles Homeless Services Agency (LAHSA) visited the shelter to evaluate it’s eligibility for funding. The homeless service agency’s 2015 Homeless Count identified more than 25,000 homeless in the city of Los Angeles. Countywide, homelessness has risen 12 percent since the 2013 count, from 39,461 to 44,359. On Monday, LAHSA spokesperson Kelli Pezzelle told EGP the church does not meet the agency’s safety standards. Among the issues, pews are too narrow to be used as beds and there are no fire extinguishers, Pezzelle said. The agency rejected the funding request for the Winter Access Center, but reversed its decision Wednesday. Following LAHSA’s reversal, Cedillo said he “immediately introduced a motion to place the site on the winter shelter list, securing protections under the shelter crisis. This will allow them to access LAHSA funds and operate through the winter season,” the councilman said in a news release. Councilman Jose Huizar also jumped in to support the center, getting approval from the council to allow him to transfer $20,000 in his office’s discretionary funds to the shelter. The city council Wednesday also approved a motion Cedillo introduced Tuesday asking the Dept. of Recreation and Parks to immediately open the Bridewell Armory in Highland Park as a winter shelter. Cedillo’s request comes on the heels of the approval of Councilman Jose Huizar’s motion to allocate $12.5 million for “immediate assistance for homeless, rapid rehousing and winter shelters” citywide. The funding includes $10 million for “rapid re-housing” subsidies for nearly 1,000 transients to help them with rent or move-in costs. The remaining funds will increase shelter beds this winter by more than 50 percent — to a total of 1,300. These beds will be targeted to those living in the Los Angeles River bed and the Tujunga and Arroyo Seco washes. “While some of this money helps prepare long-term infrastructure to address homelessness, the bulk of the money is for immediate actions to help people get off of the streets,” Huizar said. The center has remained open with support from the local community. The neighborhood councils of Highland Park and Eagle Rock have each approved funds for the center: $1,000 and $4,000 respectively. While everyone in Northeast L.A. is talking about homelessness, no one is doing anything about it, explained Eagle Rock Neighborhood Council President David Greene. Individuals have donated cooked meals, clothes, books and pet food; volunteers are running the shelter, open from 7p.m. to 8a.m. For those lucky enough to get a spot for the night, it’s a safe and warm haven from the bitter winter cold. Every night, volunteer Nereida Vazquez greets shelter residents, sometimes staying overnight to see to their needs. A former drug addict and victim of domestic violence, Vasquez says she knows first hand the value of having a place to sleep, since she was once homeless and had her three children taken away by the department of family services. It feels great to now be in a place to give back to those in need, she told EGP. Vazquez’ mother and daughter visit her at the shelter and her daughter helps out. “I feel very proud to have my family here,” said Vazquez, adding volunteering is a valuable lesson for her daughter. Recycled Resources hopes to link participants to the supportive services they need to improve their situations before the temporary facility shuts down in March. Monica Alcaraz, a Recycled Resources volunteer and president of the Highland Park neighborhood council, told EGP they evaluate each shelter resident’s situation and recommend the appropriate assistance. “The cases are different, some of them want to apply for housing, others need basic documentation like an [identification] or social security card,” she said. According to Hope, Recycled Resources has already helped the sisters apply for Section 8 housing, which they hope to get into before the shelter closes. “We are not bad people, we just happened to be on the streets and we need help,” she said with a sense of sadness. For more information about the shelter visit www.recycledresources.org .